Splenda is not satisfying—at least according to the brain. A new study found that even when the palate cannot distinguish between the artificial sweetener and sugar, our brain knows the difference. At the University of California, San Diego, 12 women underwent functional MRI while sipping water sweetened with either real sugar (sucrose) or Splenda (sucralose). Sweeteners, real or artificial, bind to and stimulate receptors on the taste buds, which then signal the brain via the cranial nerve. Although both sugar and Splenda initiate the same taste and pleasure pathways in the brain—and the subjects could not tell the solutions apart—the sugar activated pleasure-related brain regions more extensively than the Splenda did. In particular, “the real thing, the sugar, elicits a much greater response in the insula,” says the study’s lead author, psych­ia­trist Guido Frank, now at the Univer­sity of Colorado at Denver. The insula, involved with taste, also plays a role in enjoyment by connecting regions in the reward system that encode the sens­a­tion of pleasantness. If that theory plays out, there could be implications for those who use artificial sweeteners as a weight-control aid. 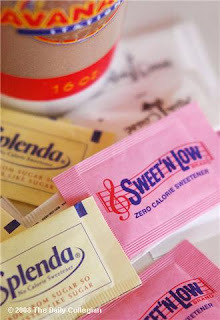 Recent research indeed suggests a correlation between artificial sweetener intake and compromised health. In one large survey, diet soda consumption was found to be associated with elevated cardiovascular and metabolic disease risk. A different study reveals a possible mechanism behind this effect: rats that were fed artificially sweetened yogurt in addition to their regular feed ended up eating more and gaining more weight than rats that ate yogurt with real sugar. The study’s authors suggest that exposure to an artificial sweetener may undermine the brain’s ability to track calories and to determine when to stop eating.